The drive from Edinburgh to Bath, whilst scenic, did not really provide much of note so I shall skip straight to our day in Bath. We joined a walking tour in the morning with one of the Mayor’s Volunteers and she took us to see the main historic sites in Bath. The tour highlights where the Roman Spas, forgotten underground for hundreds of years before being excavated for public viewing, and Bath Abbey, completed in 1539. Bath was essentially a centre of wellbeing and rest and that feeling still exists today with a number of dayspas offering the latest in mineral treatments. Just like the Romans did, people from all over the world come to soak in the hot springs for their healing (or at least relieving) qualities. Still the springs pump up 250,000 gallons of water a day. 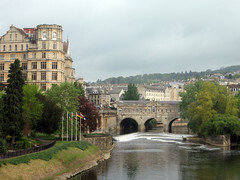 Somone asked the guide had the city of Bath done anything to harness this sort of energy – not yet.